A Food Memoir with some traditional and contemporary recipes from the kitchens of Hyderabad and Coastal Andhra laced with a hint of nostalgia. Heat a kadhai (wok) pour and swirl the oil around let it heat up throw in the chopped onions and let them cook until they turn golden now add in the tomatoes and cook until they are mushy reduce the flame to avoid burning let it cook till onions and tomatoes are completely reduced to a paste and oil begins to leave the sides of the pan.Add the ginger, garlic and when they begin to brown add the chicken(clean and dry)followed by the spice powders and salt, mix well and let it cook.Add 1/4 cup of water and cook covered on a low flame for 10 minutes add the chopped chilies coriander and mint leaves reserving some for the garnish. 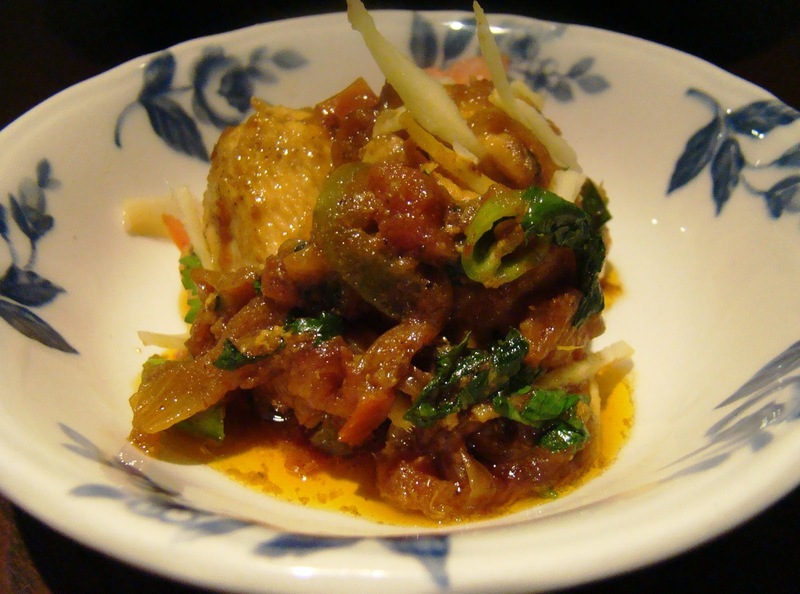 Stir the chicken to prevent sticking at the bottom add a little more water if required.Cook for 5 minutes until chicken is tender.Turn off the flame and garnish with the ginger julienne, mint and coriander greens.Serve the chicken kadhai immediately with paratha, roti naan or steamed rice. Nihari is a heavy brunch menu and it cooks all through the night if made of lamb shanks but chicken is just under an hour.It is excellent for colds and really heart warming and appetizing on a cold winter day.With All the modern fare, cooking Nihari is never an issue but when I was a child during the eighties Nihari would be such a fuss in Hyderabad.I get vivid memories of my first Nihari and the difficulty I had to remember the name over all the din and excitement at home. Sugra Bi our cook at Hyderabad was an expert at making it and under my grand aunt's supervision she would do it patiently and lovingly.She had a knack with spices, artfully putting them in a muslin cloth while her green bangles went on tinkling as she handled the deg and all this added to the gala affair.The next mornings brunch would have her tending to all the little chores associated with the nihari and she had a beautiful batua of betel nuts and spices which would keep her going through the night's labor.The Nihari brunch would have quite a lot of guests the other day and since she stayed in the outhouse she was never in a hurry.The 'deg'(pot/cauldron) would be tended on a wood fire at the back of the house and the wood from the ber(a kind of Indian berry)tree would be used along with the charcoals.While we children went out in the night to peep in at the woodfire cackling and threatening to lap up the deg (huge pot/cauldron) we would be reprimanded for coming out in the misty air of the night and ordered to get inside immediately. Her little shenanigans- the sandalwood being scraped with a wee bit of rose water on a granite slab under the moonlight was an interesting thing to watch and this was the secret ingredient to the nihari. Waking up in the morning and rushing off to the backyard to witness the almost dying embers, a hint of the aroma lingering amidst the bunches of different colored chrysanthemums that smiled back cheerfully on a winter morning made for wonderful memories. My grand aunt(aka amma khala) clad in her usual crisp white saree with a chikan border would carefully choose the table settings and crockery while the sheermals were wrapped and piled up and the warm aroma would fill the entire house and garden with an air of festivity. The conversations steered around the food and (numayesh) the exhibition that was always an attraction in the winter at the exhibition grounds. Some people have nihari with varqi roti but sheermals baked with saffron flavored milk and sweetened with a little sugar have their own charm..Here in Bahrain I use the pav or dinner rolls slathered with a dollop of butter and a little nostalgia from the past. So let's get started on this fabulous winter warmer called Nihari. N.B In Hyderabad you get the potli masala(bouquet garni) for Nihari and qourma called silver potli masala and this makes the task fairly easy if you don't want to make it from scratch.The version of Pakistani Nihari has fewer spices as compared to the Indian nihari and wheat or maida flour is used for thickening and added straight into the gravy skipping the tempering process. * Make mutton stock by boiling the meat and bones(additional) with a few pepper corns, and onions for 3- hrs on a low flame to extract the flavor Reserve until later.You can also use a ready made carton of mutton stock. In another heavy bottomed pan ( make the 'baghar'- tempering the gravy) heat the ghee and add the besan flour be careful with the flame, the flour should not burn.Stir till lightly brown in color and add to the nihari gravy simmering on a low flame.You could use a long handled strainer to remove the spices from the Nihari when it is done.Serve the Nihari hot in soup bowls with sheermal or varqi roti/paratha, garnished with ginger, mint,coriander leaves and quartered lemons for a twist of flavor. 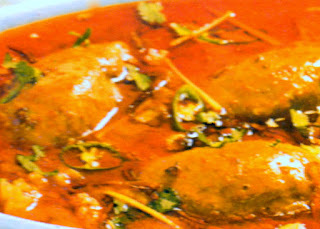 Chicken Nihari Use one whole chicken and replace mutton with chicken stock and the cooking time should be no more than 45 minutes on a low flame to keep the chicken succulent and tender and follow the same procedure.It is an easy chicken recipe that can be made on those really lazy days in winter. Now that a lot of festivals are lined up wishing all the readers Happy DUSSEHRA and Eid -ul -Adha/Bakrid in advance.Well coming back to our blog now that during the Eid season there is plenty of lamb around at home .You can make a variety of dishes like Haleem and during the next few posts we will explore all the traditional recipes that can be made with the lamb.Of course for those people who eat veal or chicken too these recipes can be modified with the available choice of meat. As everybody is aware that Haleem is purely middle -eastern and predominantly Iranian in origin and has come to India along those routes through History.You will get more info on wikipedia. Haleem is usually made in Ramadan but with cooler days (autumn) setting in and plenty of meat available during Bakrid there is no reason not to try it out.I do see a lot of Haleem recipes online but rarely do I find an authentic one as made in Hyderabad. I am disappointed when I see some recipes passed of as haleem, as experts and purists from Hyderabadi Cuisine would call it a huge mistake to include or omit ingredients as from the days of yore when haleem was made in huge cauldrons working through the night and day to have it ready.For beginners who do have tasted haleem but have no idea how to make it, let me give you some insight into the dish.There are two alterations one is khichda and the other haleem. 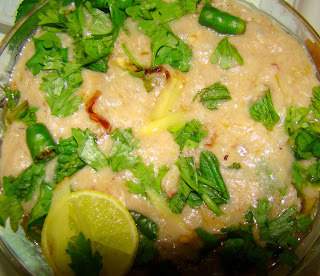 The difference between the Khichda and Haleem is that the Khichda has an assortment of Lentils added to the meat whereas Haleem purely sticks to wheat and a little barley / urad dal may be added to improve the sticky consistency.Even the khichda has chana dal,urad dal and of course masoor dal is added in the Pakistani version of haleem but never tur dal /moongdal and experts of Hyderabadi cuisine will never forgive this culinary blasphemy of sorts.However Haleem is superior in taste to Khichda. So here I have tried to be as authentic as possible with the Hyderabadi Haleem recipe. Khichda recipe will follow soon. Soak wheat,barley and urad dal together for 5-6 hrs in water. Make a paste of cashews and almonds and keep aside. Deep fry onions until caramelized(birishta) and keep aside.Mean while take a saucepan or pressure cooker and boil water enough to submerge the wheat and add 5 cardamom,cloves and cinammon sticks each and now to the boiling water add the wheat,barley and urad dal and let it cook till tender and cool.While using a pressure cooker adjust water to the quantity of the wheat and cook with a little oil on a medium flame to avoid burning at the base.3-4 whistles should be enough for the wheat to cook. Trim fat and wash mutton pieces with some select bones discard fatty bones or fragmented bones drain thoroughly add turmeric powder,red chilli powder, salt, yogurt ginger garlic paste juice of 3 lemons and marinate for 30 minutes. Remove the cooked wheat from the pressure cooker and using a hand blender lightly make it smooth but remember not to make it into a smooth paste/puree. Take a pressure cooker of considerable size add oil/ghee followed by 3 each of cinnamon cardamom,cloves and all of the cubeb and 1 sliced and browned onion.Now add the mutton along with marinade and some water to pressure cook till meat is rendered tender.If the oil floats on top of the meat when you open the cooker consider it well done.As the lamb loosens off the bone discard the bones at this point. Now mix the meat along with the wheat paste, nut paste, the Garam masala, half of the mint and coriander leaves and juice of 1 lemon.Put it back on a medium flame and using a wooden masher keep stirring the paste to avoid burning at the base and render a smoother consistency.Keep on stirring from time to time use the help of some strong masculine hands at this point rope in your husband to do it.This should take about 15 minutes.Oil should begin floating on top and now you can turn off the stove.This oils is removed and kept in a separate cup and served along with the garnish.You can also add roasted whole cashews now if you prefer. Take a plate and place the browned onions,ginger julienne,chopped green chillies,the remaining lemons quartered,finely chopped coriander and mint.Just before serving garnish each plate of Haleem with the sliced onions,lemon wedges,chillies,mint coriander and a little of the oil that has been reserved in a cup and enjoy your Hyderabadi Haleem. Wishing All RAMADAN KAREEM 2012. First my apologies to have kept you waiting for my blog posts but change in jobs, a lot of travel around the world and finally settling down in another country had my focus shifted.However, I always had foodgoddessonline on top of my mind.Between the last post and now, I have visited Singapore, Oman, Dubai, Bahrain and have been lucky to learn so much about local dishes probably some of them may find their way in my blog posts.So,this time I will greatly miss the beauty of Ramadan in Saudi Arabia.But, life is like that it always springs surprises especially when you are least expecting one. Ramadan Trivia: When Islam reached the shores of Egypt the people welcomed it with lighted lamps and they are known as fanoos and since then they are an integral part of Ramadan- all decorations with lights have the fanoos along with crescents, stars, palm trees, boats and the kettles or dallahs.Why not try incorporating the fanoos in your ramadan celebrations.For the whole month of ramadan have your gardens or front doors or even the drawing room decorated with a lit fanoos.You will find them in any middle eastern store or try getting one from Ikea they usually have them or better still don't forget to purchase one when on your trip to the Middle East.Light up the fanoos everyday in the evenings (they usually have a small tealight candles inside when you buy the non - electric version) and keep it burning every evening for all the 30 days reaching up to the Eid. 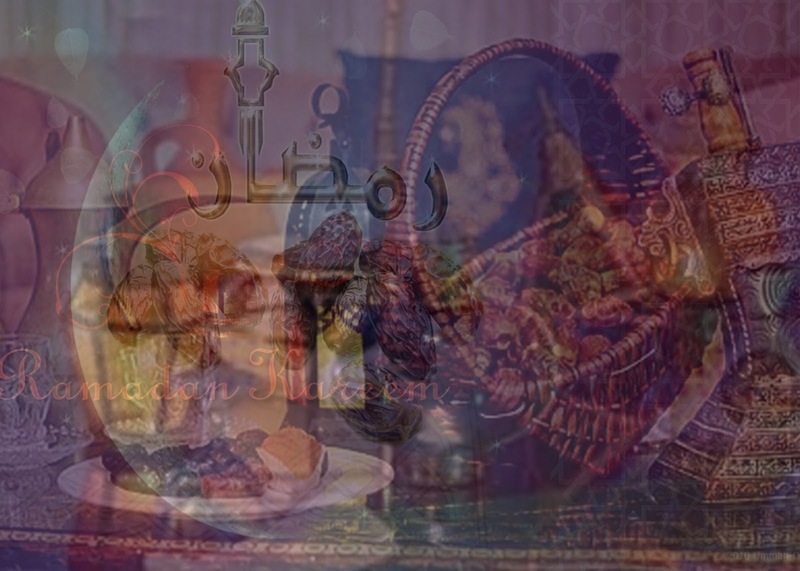 In my next post I will be doing a few recipes for Ramadan Iftaar and Suhoor meals. Eat healthy! This is a website about Indian food particularly Andhra a confluence of a mixed heritage of Hyderabad and Coastal Andhra cuisine culture. Unraveling and demystifying recipes from the golden days of yore when food was cooked in a particular way and had to stand the test of a discerning palate to be called a great dish.When grand 'Daawats'(food parties) were the only true attempt at social celebration,when smoky charcoal and firewood mingled with the tinkling of bangles, laughter and aromas of a grand dish, when spices were as well treasured as jewelry in a wooden box.Come, relive those moments from narrations of my childhood memories along with great recipes as treasured,noted and passed down from one generation to another through old diaries in a neat hand in urdu. All content copyright foodgoddessonline. Picture Window theme. Theme images by carlosalvarez. Powered by Blogger.